In the recent discussion about preserving much loved sims, people have spoken about tier, about sponsors withdrawing, about artists who really want to move on to the next project, or who face problems maintaining or reviving old favourites in the face of necessary upgrades by Linden Lab … but surely the saddest loss of all is that occasioned by the death of the sim owner. This has happened recently in the case of Dirk Talamasca who as well as being a tremendous grid evangelist, provided practical help to many artists by maintaining their work on the grid. Now, with his passing, this too shall pass – and, I believe, has passed. 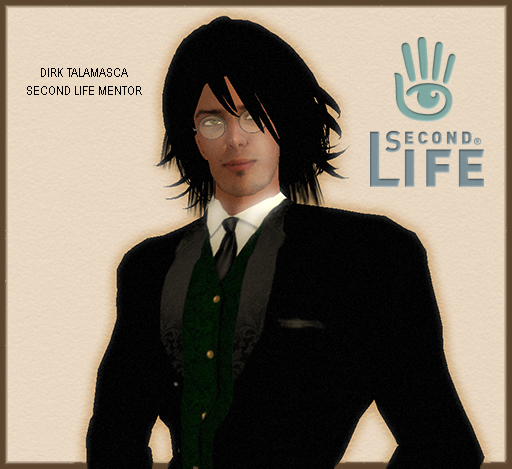 But the memory of Dirk will be celebrated today with a memorial at at the Linden Memorial Park this Saturday, April 5 at 4:00 PM to remember the wonderful times, help, and laughter that Dirk so freely gave to all who had the good fortune to meet him in his nine years in Second Life. Please spread the word in SL and via social media. Everyone is welcome. We are also planning a special Designing Worlds show as a tribute to Dirk. He appeared on the show several times, talking about issues that affected the grid. Indeed, the last time I saw him inworld was when he came to the viewing party for a show on Materials and Server Side Baking. If you would like to take part in the show, perhaps contributing your memories of Dirk and what he meant to you, please contact us through the comments here, or directly to Saffia Widdershins inworld or by email. The show will be recorded on Thursday April 10th, and shown on Monday 21st April. We will be holding a planning meeting at 2pm on Tuesday, April 8th in the Designing Worlds studio on Garden Of Dreams. Previous Post: Prim Perfect Jigsaw: Celebrate International Tabletop Day!